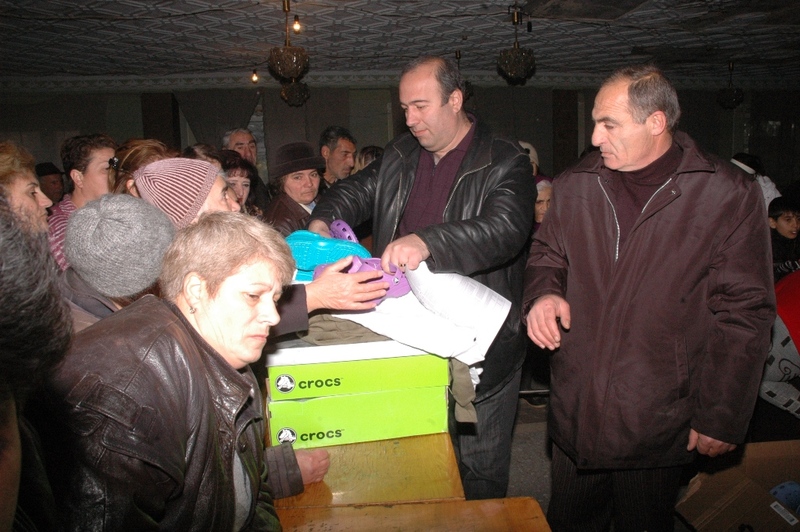 [FAR & BAFA Soup Kitchens]: FAR & BAFA Distribute Christmas Gifts to Nor Hajn Soup Kitchen. Every holiday season FAR visits its five soup kitchens to deliver Christmas gifts to regular visitors. 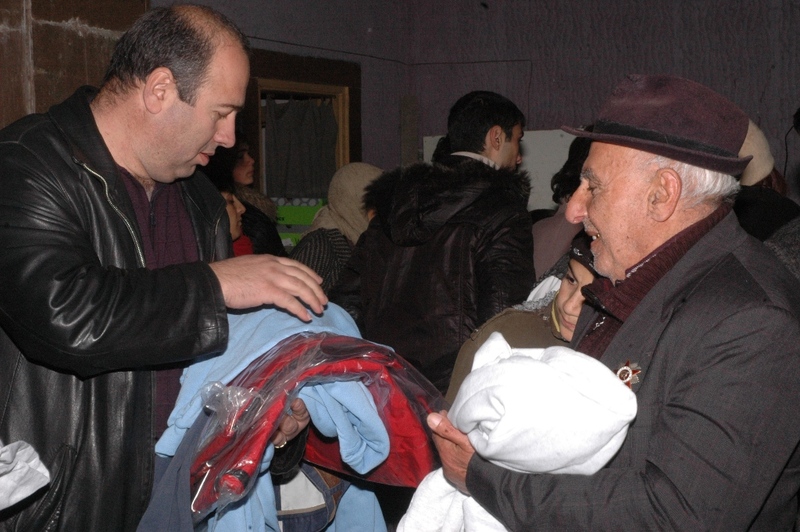 December 24 brought staff to Nor Hajn where they distributed to new clothes, shoes and jackets. A member of the Bay Area Friends of Armenia (BAFA), which financially supports the kitchens, also joined. 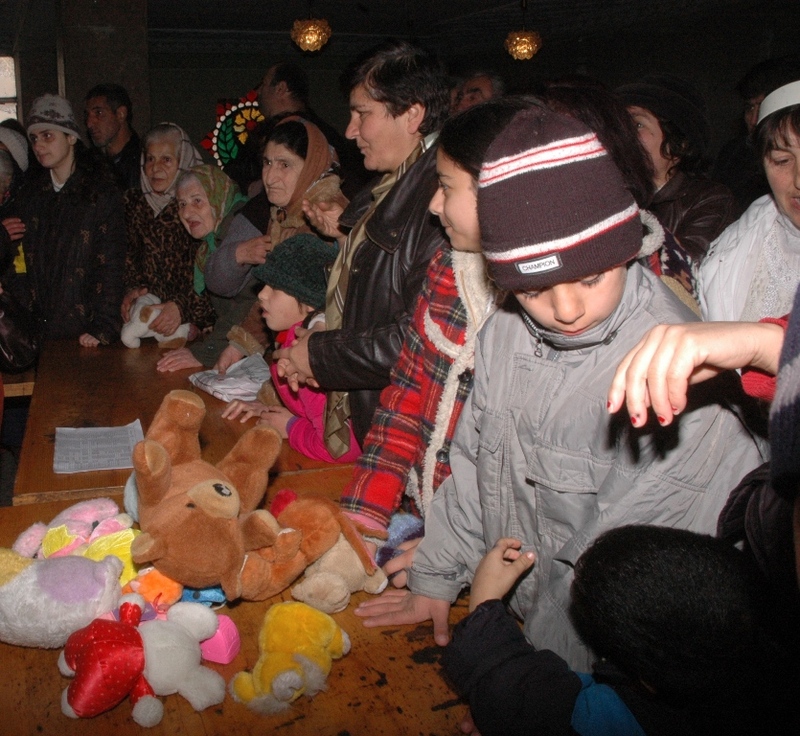 BAFA Board member Lusine Kassarjian distributed the clothes and toys she had gathered over the course of two months thanks to the support of numerous individuals and organizations, along with some helpful PR from Yerevan’s “Shunch” Yoga Center, which advertised the drive through their website and Facebook page. [Armenian Life]: Armenian-American Artist to Perform at The Club Tomorrow Night. Armenian-American artist Melissa Boyajian will be showing several of her photo and video pieces at The Club (40 Tumanyan Street) in downtown Yerevan at 6 pm tomorrow night. A native of Boston, MA, Ms. Boyajian’s work will encompass issues of post-colonial identity, Armenian Diaspora identity, and cultural assimilation, among other things. FAR’s Hasmik Manukyan will be translating the presentation. Click here for more information. [Dispatches from Armenia]: Nor Hatjn’s Kitchen. Just outside Yerevan, lies the town of Nor Hatjn. The other day, three of us – Arto, FAR’s program director, Rafik, director of FAR’s soup kitchens, and myself – paid a visit. During the YPT trip we visited the Gyumri soup kitchen, so I sort of had an idea. Financed by the Bay Area Friends of Armenia and carried out by FAR, five different kitchens provide a full lunch to recipients every day in different parts of the country. 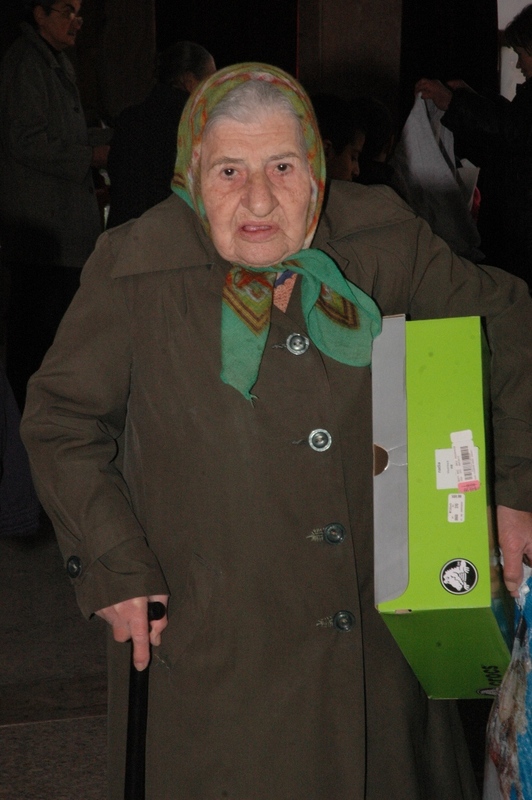 Most of FAR’s kitchens, like Gyumri’s for instance, serve the elderly – former doctors, professors, teachers, and scientists whose pensions barely cover basic living costs. Nor Hatjn’s kitchen is a little different. The recipients are families, primarily refugees from the war with Azerbajian who have settled and raised their children here. This is a town where there is literally no job opportunity – the two factories, one diamond cutting, the other for car parts, closed down awhile ago and there’s not much else going on in terms of commerce. Most residents live in subsidized housing and 200 people come to the soup kitchen for their meat, lavash, and fruit every single day. Sure enough, we were surrounded by what seemed like dozens of exuberant children once we walked into the room. They weren’t shy about practicing their English as we circled around the room and bantered back and forth. My camera was a hit — as I knew it would be — and I handed it over to them so they could snap group shots and family pictures. The terrazzo floor and old chandeliers hanging were the only signs of this building’s former glory. Paint peels off the walls; water drips constantly from the pipes in the kitchen. And every single day the water is shut off. The owner of the building is bankrupt, doesn’t pay the water bill, so every single day the managers must fight to have it turned back on so they can prepare this necessary meal. It’s a constant, unsustainable battle. The option would be to buy the building and renovate it, which would cost about $100,000. BAFA is working on fundraising for these efforts now, but of course there’s a long way to go. The other option would be to leave this building and re-open the kitchen somewhere else. But what would the people of Nor Hatjn do? Traveling to another town altogether just to eat would be a hardship, especially in winter. Plus, many depend on leftovers to feed them for the rest of the day. This is a place where their families gather, where their children play, and where they aren’t afraid to complain when the menu changes. They’d most likely lose their primary source of sustenance, and as it seemed to me, their center of community. I truly hope that does not happen. Despite the obstacles, FAR staff still makes this soup kitchen possible, and there’s no doubt that they will continue, but here’s hoping for things to be even better someday. [CME]: Better Qualified Doctors for Armenia. Four of Armenia’s doctors are now even more capable and better equipped to serve their home regions after completing FAR’s Continuing Medical Education Program. All of these doctors, normally based in Armenia’s provincial regions, spent the month of July training with leading specialists in Yerevan. Graduation was held today at FAR’s office. Dr. Hambartsum Simonyan, FAR’s health programs coordinator, thanked each of this month’s fellows for their enthusiasm, responsible attitudes, and their effectiveness. Each of the fellows focused on different specialties — anesthesiology, pathology, neonatology, and infectious disease — and all said their practice will now benefit greatly from this new experience. CME gives doctors from Armenia’s rural areas the opportunity to enhance their modern medical knowledge and practice. These doctors have the opportunity to learn about innovative approaches and methodologies from top healthcare providers in Yerevan free of cost. Dr. Alvard Hayrapetyan worked in the anesthesia and intensive care department of Kanaker-Zeytun Medical Center, where she focused on spinal anesthesiology. She’ll return home in Vanadzor knowing how to better monitor patients during surgery and also pass these techniques onto her staff members. Dr. Armine Harutyunyan participated in CME for the second time. A pathologist, she focused on the diagnosis of cancer in women. Dr. Stepan Melronyan, an infectious disease specialist, focused on improved diagnosis of certain infectious diseases like tuberculosis at Abovyan Hospital. And Dr. Hasmik Muradyan focused on becoming better acquainted with new technologies and equipment for neonatal care. [Armenian Life]: Art Exhibition this Weekend in Yerevan. The Women’s Resource Center in Yerevan will hold its Summer 2010 Art Intervention, “Queering Translation” from July 31 – August 1. A diverse school of Armenian artists will be presenting their work, which will focus on translation as a cultural practice that both unites and divides. WRCA is working in the area of women’s human rights, reproductive and sexual rights, sexual violence and women’s role in the conflict resolution and peace building in the South Caucasus. Please continue here. [FAR’s Intern(s) in Armenia – Samantha]: Farewell. The cliché must be true… my travels truly have changed me and Armenia will always be a part of my life. At the same time I think I left a chunk of myself there, too. Not only in the sense that my sleeping patterns are still stuck in Yerevan time, but I don’t think I could feel complete without returning again. I finally see what the Diaspora has been fighting for. Armenians love their land and they are a crucial part of it. Through the wars and genocide, they have fought for the right to remain Armenian while holding onto the values of hard work and family. Farmers climb uphill for four hours to find fresh grass for their cows. Suddenly the nine to five job doesn’t seem so bad. And they still manage to take a stroll with their neighbors every night. We have a hard time balancing work with our social lives in America. If nothing else, I’ve learned to take time out of my day for family and friends. Armenians are also some of the most hospitable people I’ve ever encountered. They are willing to spend their last penny on a dinner guest, no matter who is the wealthier in the situation. We could use a little of that generosity here. It brings a feeling of unity to the nation, especially with the struggles of the last century. After a few tearful goodbyes, I realized that nine former strangers are going through the same feelings. We all felt that warmth and empathy for the people and their land. I guess that’s why it’s a cliché. They work so hard for what they have and value the things that really matter in life. If it wasn’t clear to me before, the saying “money doesn’t buy happiness” now makes sense. It’s almost impossible to leave Armenia without feeling like you belong to a culture that welcomes you into their lives with open arms.